Arden Shakespeares new critical edition of Romeo and Juliet  the long-time favourite of the student of Shakespeare from classroom to university lecture theatre  is at once carefully learned and calculatedly accessible. This edition, published in 2012, follows the previous years The Tempest, and precedes the current re-working of Coriolanus in Arden Shakespeares third series. 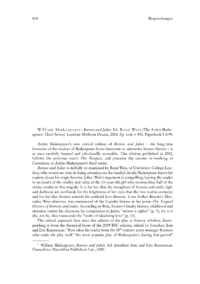 Romeo and Juliet is skilfully re-examined by René Weis, of University College London, who wastes no time in fixing attention on the familial details Shakespeare leaves his readers about his tragic heroine Juliet. Weiss argument is compelling, leaving the reader in no doubt of the vitality and value of the 13-year-old girl who monopolises half of the titular credits in this tragedy. It is for her that the metaphors of heaven and earth, light and darkness are conflated; for the brightness of her eyes that the two realms compete; and for her that Romeo amends his artificial love rhetoric.